This is the fruit of my Summer labour (of love). 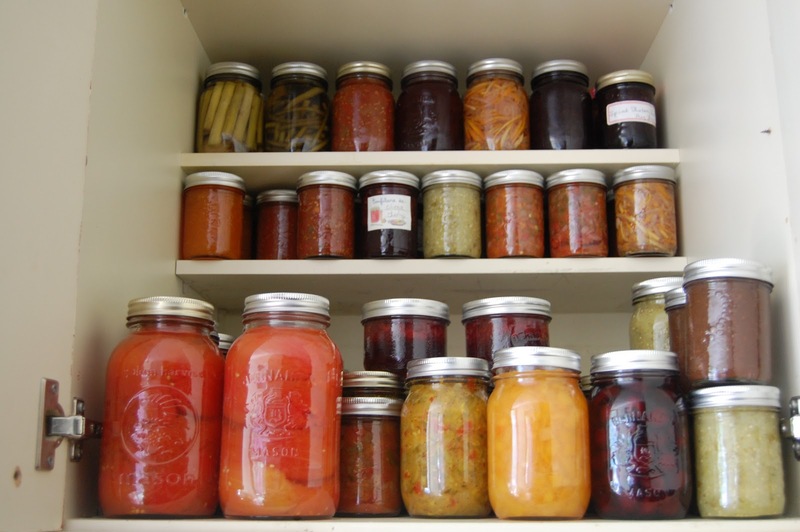 Over 125 jars put-up for the off-season. 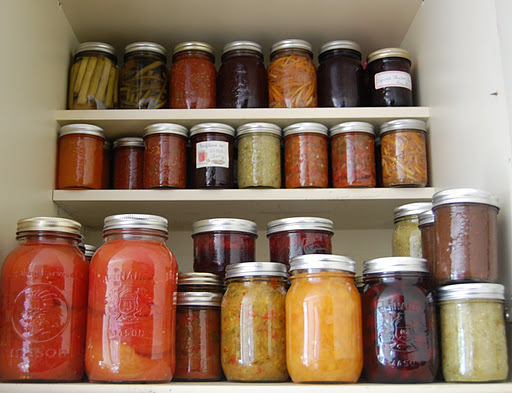 Although, there really isn’t an off season for preserving. I plan on making winter meyer lemon preserves, seville orange marmalade and winter squash pickles. I am addicted to the Ping! That wonderful noise that confirms your bounty will be air tight and sealed until eaten. The ping is victory! I wait in the kitchen expectantly for the ping. When I don’t get a chance to hear it, I tap the lids gently the next day to hear the telltale tinny hollow noise that confirms the seal. I had only one jar this Summer that didn’t seal properly, a jar of tomatillo salsa that is being eaten quickly from the safety of my refrigerator. My adventures is farmers market sourcing and preserving this Summer have been beyond rewarding. Why buy ketchup or relish when I could make it myself? I went on a day-trip to the St. Jacobs Farmers Market. The rain was treacherous, but I was willing to tough it out in order to buy beautiful turban squash, ontario garlic, leeks, grassfed beef, farm fresh eggs, unpasteurized apple cider, blueberry honey and my first brussel sprouts of the season. Compared to the markets in the city, the vendors at this market had a lot of bulk bushels of just about everything available. The canner in me was ecstatic. I saw a roma tomatoes and had to have them. 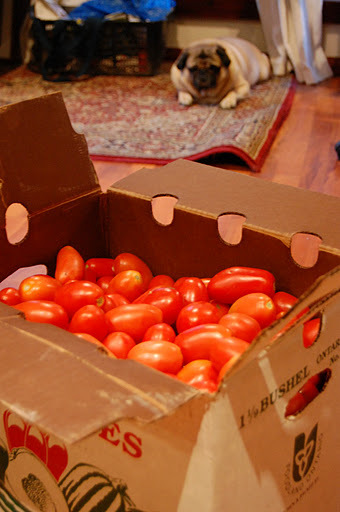 I bought just about 70 lbs of roma tomatoes to can. 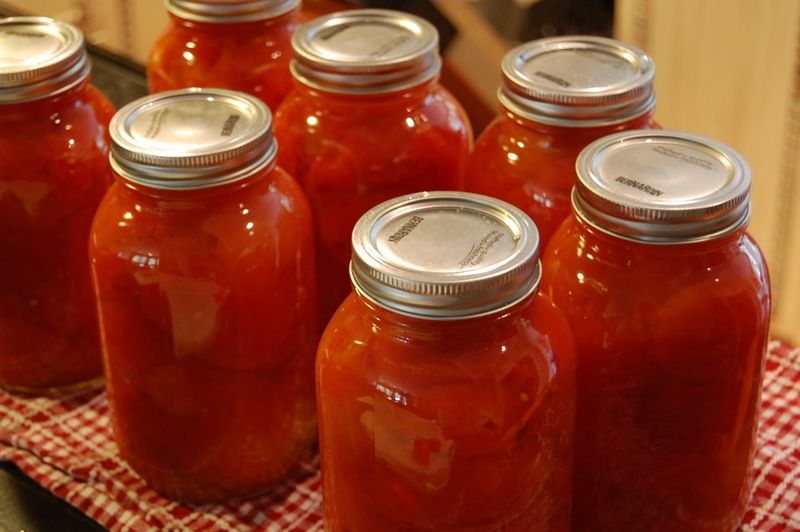 The great tomato canning of 2010 was about to begin. The lengthy process of blanching, peeling, hot water packing and 45 minute water bath made me hope and pray to hear the Ping! at the end. They pinged and I rejoiced.